From the opening track and first official single 'The End' with its soaring synths, beautifully tense guitar lines and huge power downs (tipping its cap to NIN) to the trip-hop night cityscape vibe of 'Tear The Silence' through to the Primal Scream meets Pendulum treatment in 'Accelerate' and the explosive power pop of 'Machine'; there is a distinct feeling of contrast and opposing forces as you journey through Hyper's vivid and colourful world. This feeling is emphasised in the album cover brilliantly designed by DC Comic's 'Christian Ward', which highlights the split personality that comes across when you hear the album. The Panic's huge production smashes against its lyrical melodies....in a good way! 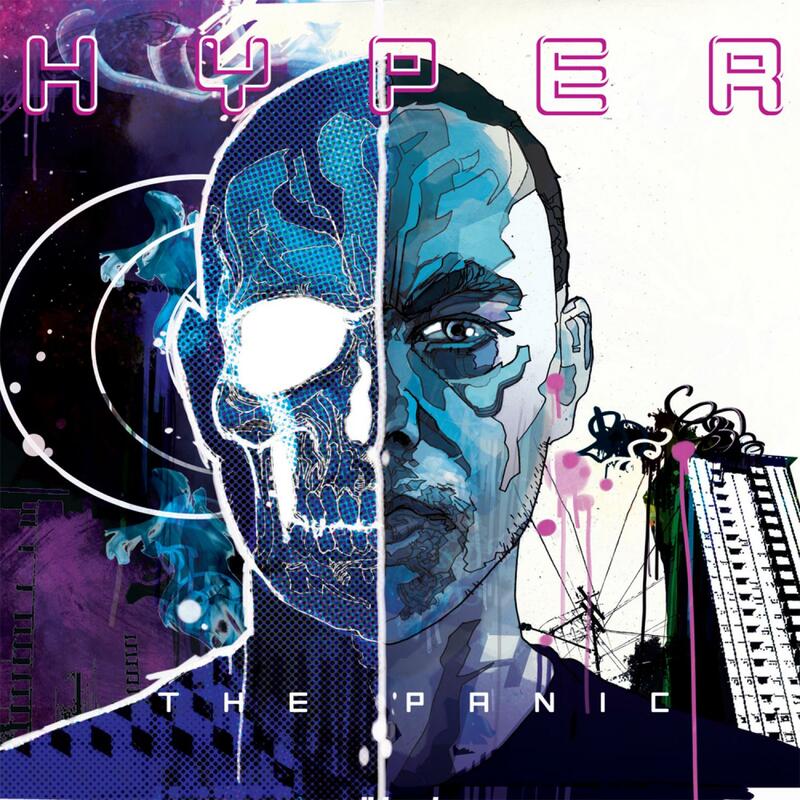 With guest vocal appearances from top UK rapper 'Genesis Elijah' and esteemed Dubstep MC/host 'Dread MC' (works with Skream/Redlight/Zinc and makes his first appearance on record) on the genre busting track 'My World' and John E Vistic's vocoder ambience on the apocalyptic finish to the album on 'I See Fire'; this album is nothing if not a breath of fresh air. However, it's not just the sonic sculpture and raw energy that defines this album; it's the intricate dynamics and song writing prowess that re-defines Hyper as an artist and takes us all with him to the next level. With the exclusive artwork from Christian Ward also available on canvas. The live band features the stunning vocals of front woman Axe together with Jim Davies (guitar+ vox)and Hyper (keys, decks, vocals) who are preparing to hit the road with all the force of a sonic juggernaut as they put the final touches to their brand new live show. Having already wowed nearly every major festival across the world including Glastonbury, Roskilde and Fuji Rock to name but a few 'The Panic' is set to spread far and wide! Written & Produced by Guy Hatfield & John Ross 9. Are You Ready? Written by Guy Hatfield, James Cocozza & Jim Davies. Produced by Guy Hatfield & James Cocozza.